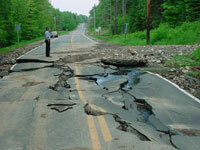 The NH HSEM Planning Section administers the Hazard Mitigation Assistance programs. The Section assists in the development of comprehensive hazard mitigation plans and projects to protect citizens and their property from exposure to all hazards including: natural, human caused, and technological. 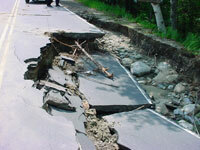 What are the different grants available within Hazard Mitigation Assistance? The Hazard Mitigation staff oversees the Hazard Mitigation Grant Program (HMGP), Flood Mitigation Assistance (FMA), and Pre-Disaster Mitigation (PDM) Program. Federal funding is provided for cost effective and sustainable projects through these three programs. undermining the integrity of the road. Visit HSEM's Resource Center for forms and documents related to Hazard Mitigation.